[prMac.com] Yoshkar-Ola, Russian Federation - Virtual Space is proud to announce the release of Mum explain to me 1.3 for iOS, an app specifically designed for children with autism and mental retardation. Mum explain to me serves to help develop children's cognitive skills, improve social adaptation as well as recover their psychic and emotional health. 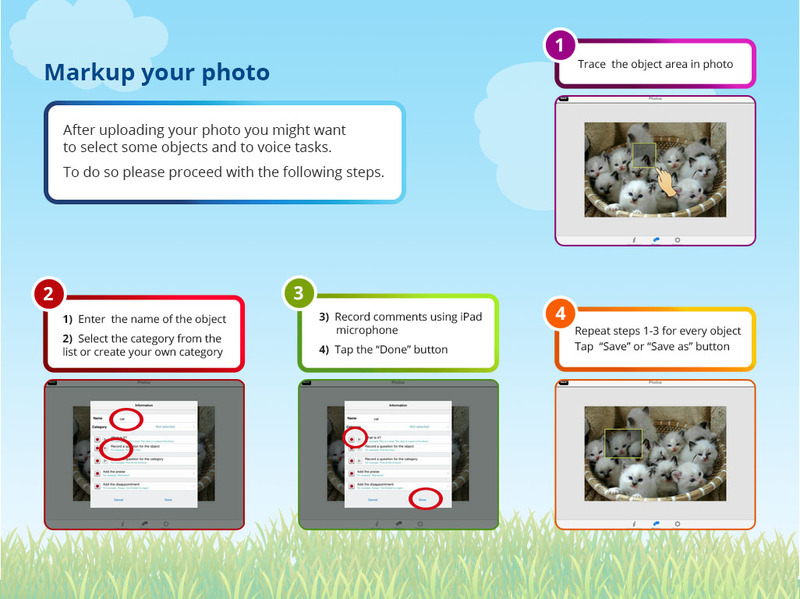 Moms can show, explain and ask the child about everything using a photo and this app. It may be hard for children diagnosed with autism, Down syndrome or other learning difficulties to remember the names of different objects and understand what is what and why. With this unique application, mother first talks to the child about different objects surrounding them, then asks: where is it, show it to me as the child finds the required objects in the photo. For example, she can describe and show what is in the kitchen or in the street or in the park. How can she do it? Very easily: Take a picture of the kitchen, mark the furniture in the photo using the app - the table, the chair, the cupboard - then the tableware - cups, plates, spoons etc. Then record your speech: this is a chair, chair is furniture, this is a plate, plates are tableware. Why does mother need to record her voice? Research shows that mother's voice and the words said by their mother are of special importance for the child's development. When the child takes the tablet in their hands, the tablet will tell them in their mummy's voice every-thing about everything and then ask questions. The child will understand and remember everything and will be happy! The app "Mum explain to me" uses pictures of familiar objects that are marked and voiced. While playing, the child will learn to identify objects and categorize them by a certain common feature which is a very important skill for the development of kids. The feature of extension is a true advantage of the app. Therefore, parents are engaged in the game by uploading and marking their own pictures in such a way as to let their child recognizetheir own house, toys, street etc. Mum explain to me 1.3 is $1.99 USD (or equivalent amount in other currencies) and available worldwide exclusively through the App Store under the Education category. Virtual Space OOO has over 10 years experience in educational applications development. Copyright (C) 2015 Virtual Space OOO. All Rights Reserved. Apple, the Apple logo, iPhone, iPad and iPod are registered trademarks of Apple Inc. in the U.S. and/or other countries.